Values will serve as the defaults for the model when the grid arrays in the model explorer are first populated. Note that once the grid arrays in the model explorer have been populated, changing the default values will not have any effect on the model. Changes can be made at the Define Properties step or to reset the values of a group back to defaults, delete the applicable node on the model explorer, update the default values as desired at the Modeling Objectives, and proceed to the Define Properties step to regenerate the deleted arrays. 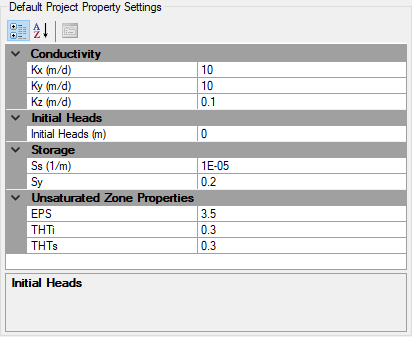 Please Note: Effective porosity (Ep) and total porosity (Tp) values are specified in the Project Settings window.